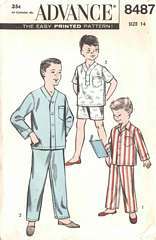 Vintage Advance sewing pattern 8487 for boys' pajamas in three styles. Cardigan top with convertible collar; cardigan top with banding; pullover top with banding. Trousers in short and long length with drawstring waist. Boys Size 14; Chest 32. Pattern is uncut and complete. Envelope clean and solid; lightly aged.